It was always going to be tough for John O’Shea in the early days as the new head trainer of Godolphin. O’Shea took over from Peter Snowden in early May, who trained some of the most gifted gallopers this country has produced in recent times, including Denman, Sepoy, Helmet and Long John. But in the time since O’Shea has taken over, the global racing giant has gone backwards. It’s hard to point the blame directly at O’Shea. It is his first proper season at the job, and taking care of at least 300 horses is no easy task. But the numbers don’t read well when you line them up against Snowden this time last year. In September 2013, Snowden saddled up 116 runners, winning 23 and placing on another 25 occasions. 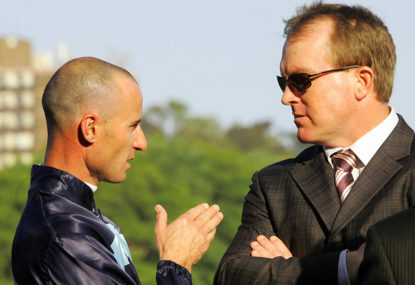 Fast forward to September 22, and O’Shea has saddled up 47 runners for 4 wins and 8 placings. As I’ve said, it is his first season in charge and the bad weather in Sydney during the winter didn’t help. But the numbers aren’t good for a racing empire that prides itself on success and producing the best youngsters. What quality of animal could springboard O’Shea and Godolphin to the top of the tree in the key races from a breeding perspective? We saw in the Golden Rose they had two contenders, Kumaon and Sarajevo, and both failed to get the victory to propel them to future stallions. Prior to that, Meursault, a highly touted horse after his debut win, had run poorly in two runs and his campaign is up in the air. Earthquake was one of the star fillies from last season, but has been just ok in two runs this Spring, not winning and being well held. In saying that, her breeding future is sealed thanks to her Blue Diamond triumph. The lone three-year-old that looks impressive is Sweynesse, the impressive winner of the Spring Stakes (1600m) at Newcastle last Wednesday. He appears as though he’ll go close in the Spring Champion Stakes (2000m) and then the Victoria Derby (2500m). Apart from him, there really isn’t much on offer from Godolphin this Spring and the betting markets indicate that. Here’s hoping that the new crop of babies can fire for O’Shea. Prior to taking the gig, we know he was an outstanding trainer, but results need to start coming his way soon, otherwise his legacy and reputation could vanish.